Bilingual Mommy Kangaroo teaches shapes, fruits and colors through the fun shape sorting game. By inserting the shapes through the corresponding holes in her pouch, the child learns something every time. If the child presses the buttons on the pouch, it listens to three amusing songs that introduce the selected theme. Touching the nose, the child will hear more nursery rhymes and melodies with an amusing sound effect. 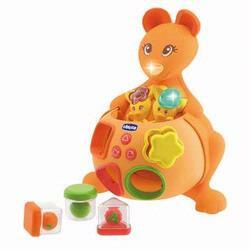 Mommy Kangaroo is bilingual (English/Spanish): it sings and talks to the child helping to familiarize them with the first words in a fun way.